For this demo, I let the user choose from a few hard coded source and destination locations. For each preconfigured source and destination, I looked up the latitude and longitude, and stored them with the option. When the user selects from one of the source and destination pairs, I pass the associated latitude/longitude coordinates to the API. This is just a demo, so a real solution could be more dynamic by allowing the user to query for directions based on points of interest also returned by the API. 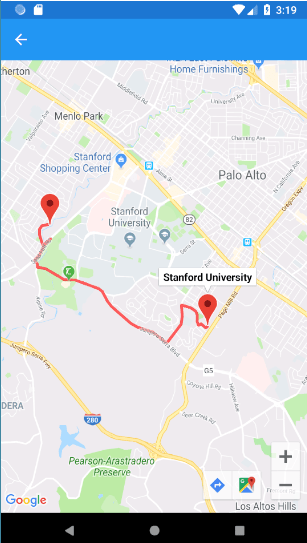 For this post, I’m returning the route for Stanford University to Pizzeria Delfina in Palo Alto, California. 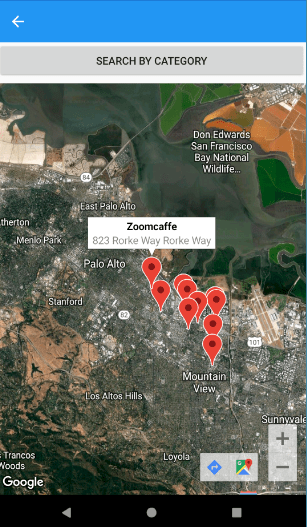 (Palo Alto is the default simulated location for the Android Emulator). Here’s a screenshot of the view where a user selects from one of the locations. Its just a few buttons. Here’s the resulting route drawn as an overlay on the phone’s native map. I was able to draw the polyline overlay using this technique for Xamarin Forms Maps. To start I’m using a switch statement based on the user’s selection and passing the hard coded lat long to the API. Notice I’m instantiating the map AFTER I get the results back from the query. This was because of the way the overlay is drawn on to the map for Xamarin Forms. It involves creating a custom renderer which listens to when the map is instantiated. At first, the overlay wasn’t drawing on the map because I was instantiating the map before making the API call, and the listener on the custom renderer was running and rendering the map before the results of the route query were returned. This is one of the rare cases where I personally declare UI in code, to control the declaration timing at run time. After I instantiate the map I place a pin on the starting point no matter which route is chosen. Then I place a pin on the selected destination. So there you have it. I’ve always been a sucker for POI, mapping etc so I’m excited to be able to explore the mapping API more. You need to pass your api key, a strongly recommended country set limiting parameter, the api version, return format (json), and a lat long. 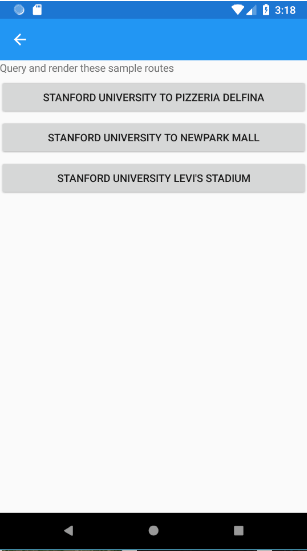 In my Xamarin app, I built a simple page with a button upon which clicked, takes you to a page with a listview of categories. When you click a category, I pass the selected category back to the previous page, perform the search and render the results as map pins on the map. Here are the results after you select a category. Here’s the code to populate my list of viewmodel. You can see its a mix of Material Design and Font Awesome icons. The ‘fa-‘ and ‘md-‘ text triggers the ‘Iconize’ element to render from the icon set of Font Awesome and Material Design accordingly, based on whatever icons are included in the project by installing the nuget packages for that icon set. You can see I’m attempting to grab the user’s location and pass it to the API along with the category selected. That’s about it. The Azure Maps service is proving to be pretty awesome. I’ve been waiting for something like this for years. 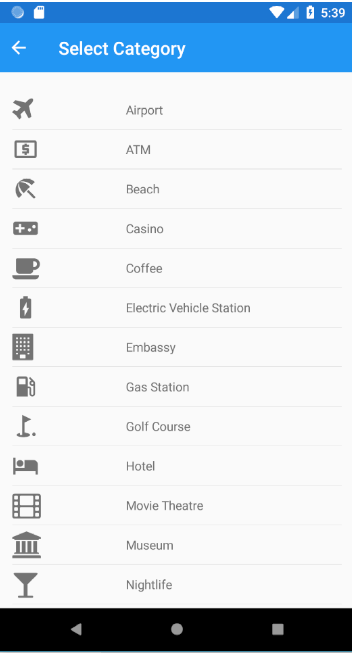 It makes it easy to add location intelligence to your apps! Happy coding.